Watercolour of Downpatrick Cathedral in Ireland after it was renovated. A Cathedral was built on this site in c.1220 but over the years it was damaged by war and fire and it was abandoned at the suppression of the monasteries in 1541. By 1790 the cathedral was a ruin and Wills Hill, Earl of Hillsborough, and the then Dean, the Honourable and Reverend William Annesley decided to gather funds to restore it. King George III even gave a gift of £1,000 to support the development. 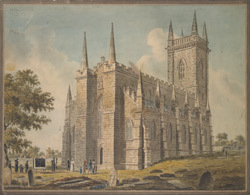 Although this watercolour is dated 1796 the renovations did not actually finish until 1812 and the Cathedral was not consecrated until 1818. Fragments of the original building remain and can be seen in the crosses, the font and the walls of the renovated Cathedral.